Do, learn to do, learn to learn to do? If our ‘what’ are our choices, our ‘how’ are our actions, and our ‘why’ are the reasons we choose our ‘what’ or do our ‘how’ (See post “The dubio-formula!“), than how would we define learning? 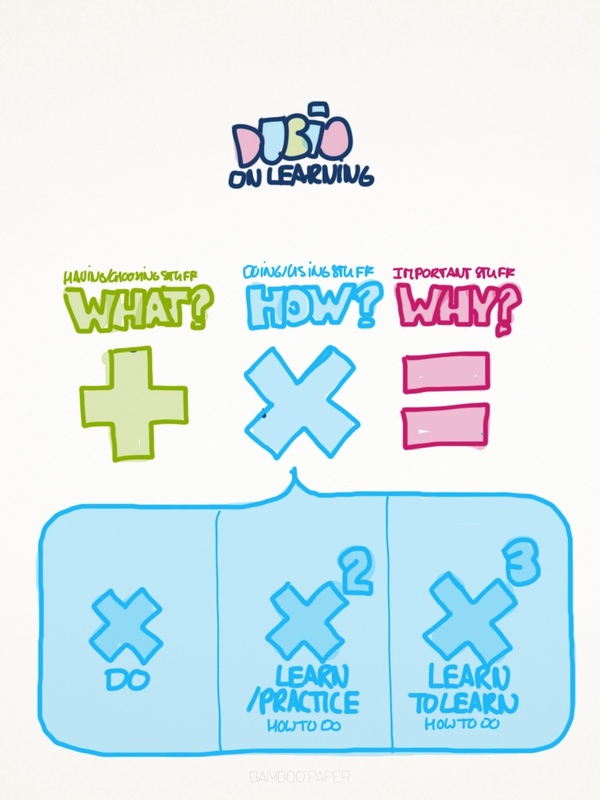 How about defining learning as ‘learn how to do’ (equals ‘how to how’ or ‘how x how’)? Then learning to learn would be how x how x how? This might sound obvious or insignificant, but I feel there is value in realising that investing time and effort in learning how to learn (…how to do something) is probably more effective than -just- investing in learning. Especially since most learning programmes (that I know of) forget about this. Interesting thought. I only struggle to see how to apply that in practice. A lot of the learning I did in recent years was not planned, not linear and sometimes very fuzzy. I only experienced the effects of what I learned in a later stage. But I never sat back and thought: how am I going to learn? How do you learn how to learn in a more planned way? Or do we just have to reserve (free) time to allow ourselves to figure out how to learn? And then apply it accordingly (or not). You should address the differences in learning in every program or curriculum, but I feel it would be hard to come up with a sort of basic approach: something for everybody’s taste. Thanks for that Jurgen, I see your point. I guess ‘planned learning’ is only part of the picture, and ‘accidental learning’ is probably more interesting, right? Interesting question is: can you plan for accidental learning? I will come back on this in one of my next posts. « Is learning the same as performing consciously?